Steinbeck’s description makes it clear his character is accustomed to hard, physically-exacting work. This descriptive detail sets the tone for his character’s grueling journey. 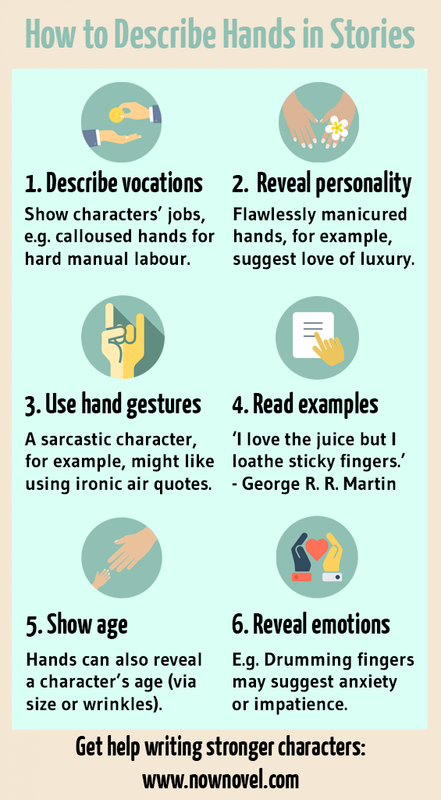 Like describing a character’s face (from ‘sallow’ to ‘gaunt’ to ‘youthful’), there are many words to describe hands that can help to flesh out your characters’ personalities. The size of the character’s hands conveys his strength. The hypothetical handshake goes further, implying the character is also an outgoing, enthusiastic person. This is a useful exercise for picturing your characters down to the finest details. A character who is cunning might have small, crafty hands, while a character who is kind might have large, generous hands. Movement and gesture makes characters animated, giving them life on the page. Describing hand signals and gestures is a useful way to show characters’ moods and intentions, or to amplify what they communicate to each other. The important thing with describing hands is not to overdo it. When you introduce a character, a hand gesture could add punch. But like every device, if you use this element on every page it will start to irritate and lose its effect. Describing hands is something the great authors do well. Like in John Steinbeck’s example above, good description adds authenticating detail, making characters feel like flesh and blood. Think of the truth in this. Say, for example, you write a scene where one character tells another something that is painful to hear but important. For example, that the other is on a self-destructive path and alienating their closest friends. Having the truth-telling character reach out and take the other’s hand, or place a hand on their shoulder, creates intimacy and a sense of trust. It shows your character’s attempt to soften hard but necessary words. Because Anthony is heir to his grandfather’s fortune, he is stifled by his own sense of impending wealth, becoming stuck in insubstantial pursuits (partying and drinking) and he struggles to find a vocation. Thus the metaphor of everything turning to dust in Anthony’s hands effectively shows the character’s inability to grasp a meaningful life, his inability to shape and control his own fortunes for the time being. People’s hands also reveal their age. An older character might have wrinkled hands, scattered with lines and sun spots, while younger hands could be plumper, softer. Are your characters’ hands fitting for their age, or do they show something telling in their contrast? For example, an older, more privileged person might have younger hands due to having done little labour (or because they have an expensive beauty regimen). Think about what details such as these tell the reader about your characters. 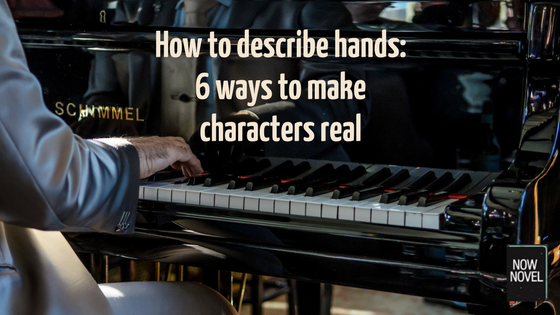 The physical appearance and movements of characters’ hands reveal plenty about their emotional state. Beware clichéd hand gestures, however. For example, hand-wringing to show anxiety or distress. How many people do you know who actually wring their hands when distraught? Including descriptions of what your characters do with their hands will add extra colour and specificity to your description. Remember to balance this type of description with others, so that your characters aren’t all hands. The key to good style is balancing the elements of writing – action, narration, description and more – so that nothing begins to read as the author’s pet technique or crutch. 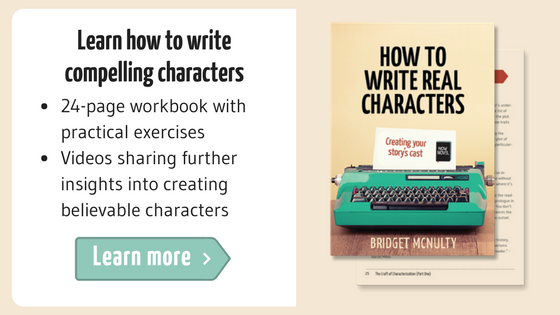 Find more articles on how to describe characters on our character writing hub. Ready to improve your characters? Join Now Novel and get helpful feedback on character description or brainstorm details for your characters using our helpful prompts and guides.